This case study is part of the CIN series Stories from the Field: Social Needs Screening and Referral Models. 1 Its resources include the tools Coordinated Behavioral Care Independent Practice Association used to take action across its systems. Coordinated Behavioral Care Independent Practice Association (CBC IPA) recognized that to build an effective community-based referral network among its organizations, it would benefit from partnering with a vendor to create an online community resource directory and referral system. Internal network management: CBC worked with Healthify to map out the IPA’s community-based behavioral health services across New York City. This includes services related directly to mental health and substance use disorders as well as social determinants of health community resources. CBC sought to implement an online platform that allowed network organizations to easily search, view, and electronically refer patients to community-based program resources offered across its network. Identification and electronic management of external community resources: IPA network organizations wanted access to an up-to-date electronic directory of all service offerings to which patients could be referred when an in-network option was unavailable. Closed-loop referral system: IPA network organizations are being onboarded onto Healthify to track referrals across the CBC network. CBC plans to use this data to help advocate on behalf of the IPA’s network organizations and the patients they serve to showcase the need for community-based services. CBC IPA and Healthify teams began work in early 2018, and as of early 2019 had accomplished the first two goals listed above. They are now in the process of implementing the third goal. As the IPA continues to keep patients at the center of decisionmaking, CBC hopes to partner with innovative technologies through its innovations hub, to eventually offer a public-facing portal that provides easier access for patients to find needed community-based resources. The following case study examines lessons from CBC IPA’s work around social needs that impact health, with a focus on how it successfully implemented its online community-based resource directory and referral system. 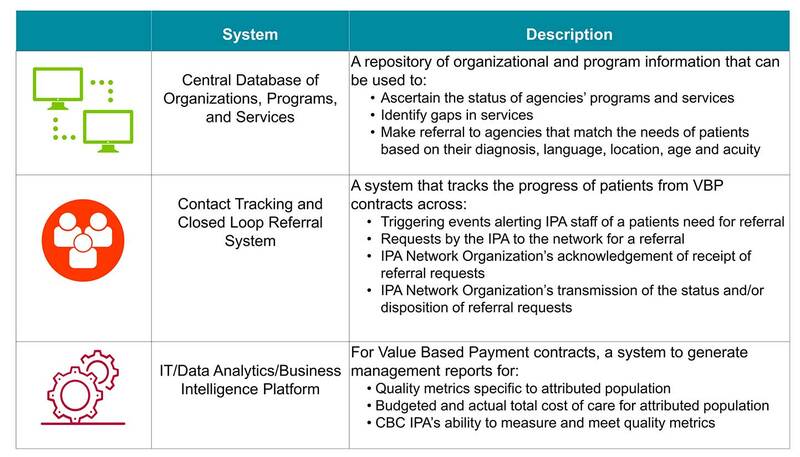 The IPA is focused on developing a clinically integrated network of community-based providers and a key component of that is to ensure patients are appropriately and timely connected to needed behavioral health and primary care services — recovery-oriented services — as well as connections to all the other social needs like housing, employment, entitlements, and food security. CBC IPA is a member-led IPA and the second largest Medicaid Health Home in New York City. The IPA is led by 16 founding member organizations in addition to a larger group of approximately 40 network partners that participate in the IPA and pay monthly dues. Although all IPA partners are considered community-based behavioral health organizations, the IPA uses the term “behavioral health” somewhat broadly, as network organizations provide a wide range of supportive mental health services, recovery services, primary care services, and social services. Project Standardize social needs screening and referral, which involves contracting with Healthify to develop and implement a community resource directory and referral system. Screening: Each IPA member organization is currently conducting its own assessment with its patients (the IPA has not facilitated a coordinated effort in this realm). 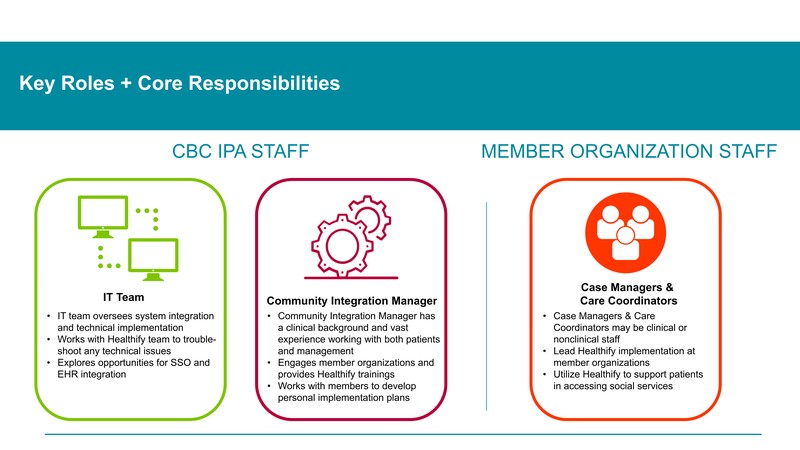 Referrals: CBC IPA contracted with Healthify and began implementing its community resource directory and referral system in early 2018. Funding Source(s) The IPA secured a grant to support a one-year pilot project with Healthify. In 2019, it extended its contract with Healthify for two years and anticipated braiding multiple funding streams (such as grants, Medicaid Health Homes funding, and member dues) to support this work. 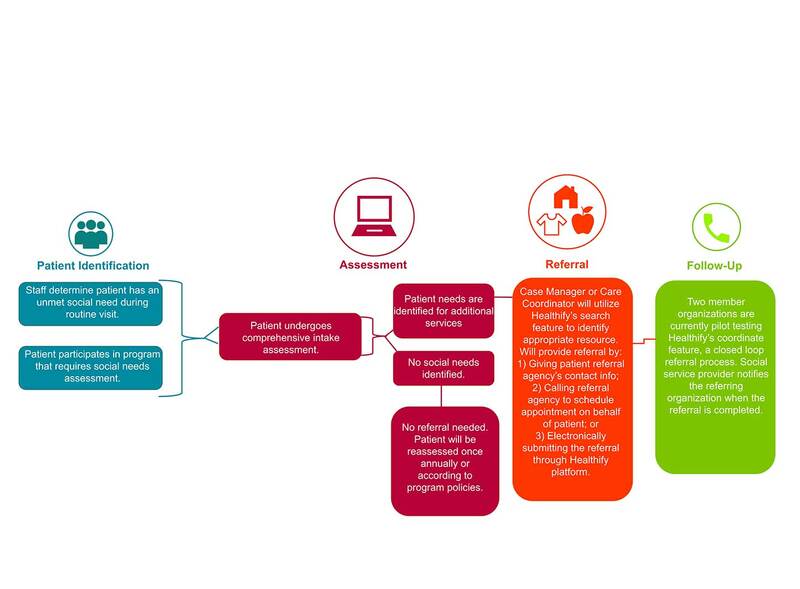 To become clinically integrated, CBC developed a three-pillar plan, which creates a platform for the IPA to conduct closed loop referrals, fill in gaps of care, and prepare to monitor network outcomes. CBC executed on the first two pillars by contracting with Healthify, a search and closed-loop referral system for community-based services. Healthify maps out the IPA network, which includes over 55 organizations running approximately 1,500 programs across the five boroughs of New York City. This partnership ensures the maintenance of a concise, up-to date resource directory of all CBC’s IPA services. In addition, Healthify offers a closed-loop referral system to enable community-based referrals across organizations. Prior to Healthify, many CBC IPA members and partners conducted their own patient assessment that included questions related to social needs. Each member organization developed or identified social needs metrics that aligned with the requirements of the various care management programs and grants. For this particular area, the IPA did not facilitate a coordinated effort. Although IPA members and partners continue to conduct their own immediate needs assessments, they use Healthify as a common model for identifying and referring patients to the appropriate social service organization. Both IPA operations staff and partner or member organizations work together to ensure the Healthify resource directory and referral model run smoothly. IPA organizations and network partners have implemented Healthify to identify and refer clients to the appropriate community-based resources. The resource directory and referral tool have been deployed in two specific ways. Search feature: The Healthify search feature allows IPA network providers to search an online resource directory (similar to Yelp) of local in-network and out-of-network social service and behavioral health programs. The directory includes a wide variety of programs, such as mental health services, primary care sites, housing, substance use disorder services, education services, employment programs, domestic violence recovery programs, and art therapy. Contact information is updated every 90 days and available for all programs that are listed. Although IPA network organizations are currently required to access the search feature by logging into the Healthify website, CBC IPA intends to implement single sign-on (SSO) once it sees adoption and uptake among 100% of users. Although it brings an additional cost to implement, SSO would allow users to automatically log in to the Healthify platform when they log in to their own internal network or electronic health record. Coordinate feature: The coordinate feature is currently being pilot-tested by two IPA network organizations. This feature allows organizations to electronically refer patients to select social service programs through the Healthify online platform. Organizations can also use the feature to track referral status through its closed-loop referral process. Once a patient has successfully kept their appointment, the network provider can mark the referral closed or completed. The member organization that made the referral will be notified when this is done. Before a new organization implements the coordinate feature, they receive a list of all their programs that are listed in Healthify. Organizations are asked to review and edit their program services list to ensure all information (such as hours, patient eligibility criteria, etc.) is correct. This process has increased accuracy in representing the vast number of programs and services offered. There are not many data standardizations in terms of naming conventions in the behavioral health sector, which makes managing referral outcomes hard to track. Breaking down services into hashtags and rolling them up into standard categories and subcategories helps align data within a large network like CBC’s IPA. 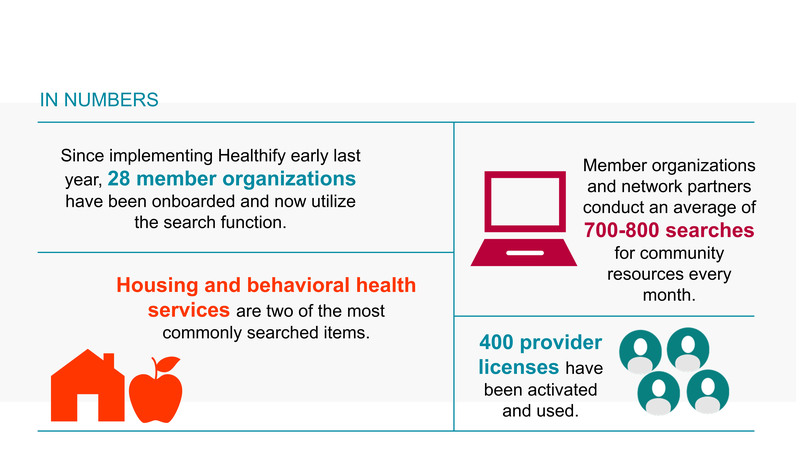 Between 2018 and 2019, CBC IPA trained 28 member organizations and network partners to use the Healthify search function. In early 2019, two member organizations were pilot-testing the closed-loop referral process through the coordinate function. (The IPA expects nine more organizations will implement this feature over the next 10 months.) On average, the Healthify platform is used to conduct 700–800 searches for community resources every month. In spring 2019, CBC IPA will continue to implement activities that drive engagement and use among member organizations and network partners. In 2018, the IPA held a successful Healthify User Challenge for three months to increase the number of staff members who use Healthify to refer patients to community resources. The user challenge inspired healthy competition among staff; the top three users were awarded $25 gift cards and featured in the CBC IPA monthly bulletin. The IPA is also in the process of identifying a business intelligence/analytics platform that will allow it to combine, view, and analyze data from disparate systems. This will allow the organization to conduct more robust analysis of Healthify referral data and combine patients’ social, medical, and mental health data in one system. Secure buy-in across sectors: Although the IPA mainly worked with its board of directors to assess different products and vendors, it recommends also inviting providers, consumers, and community-based organizations to participate in the process of selecting a community resource directory and referral system vendor. Engaging a team of cross-functional experts will result in identifying (or developing) a social service referral solution that works for everyone, and will help secure buy-in early on. Set realistic expectations: Identifying and implementing a new technological innovation is a time-consuming project. It is important to set realistic expectations about the amount of time and effort needed to engage users, pilot test, and fully implement the Healthify resource directory and referral system. Staff who were engaging organizations to adopt the resource directory and referral system needed to understand that adoption readiness levels varied among the network. Organizations adopting the new resource directory/referral system needed to recognize that although there was a heavy lift at the start of the project (including training staff on the platform, implementing new workflows, and reviewing program data to ensure accuracy), once staff began to use Healthify, they appreciated the capabilities it offered and gave very positive feedback. Engaging and training network organizations: For a large member-led organization like CBC IPA, it was important to develop both a broad IPA implementation strategy and for each member organization to develop an internal Healthify implementation strategy. It was easier for IPA staff to go out to partner organizations and engage and train staff when those staff had already heard about Healthify and their organization’s commitment to using the platform. Continuous quality improvement: Instead of attempting to implement Healthify across nearly 55+ network organizations, the IPA focused on first implementing the search feature’s community resource directory with a small number of highly engaged partners. They also tested the coordinate feature’s closed-loop referral function with two member organizations that volunteered to pilot-test it. Starting out small allowed both the IPA and the member organization teams to evaluate the effectiveness of different implementation processes (e.g., trainings and workflows) and improve upon those processes prior to distribution. Coordinated Behavioral Care IPA conducted this work on its own and without any funding or support from CIN or CHCF.